If you’ve been keeping up with news surrounding Apple’s mobile OS for the past week, you must already know that a working jailbreak is now available for 64-bit devices running the current publicly available build, iOS 9.3.3, through iOS 9.2. Once again, it is the Chinese Pangu Team that has delivered the tool, though the jailbreak is semi-untethered this time around, which comes with a minor inconvenience surrounding reboots. Jailbreak enthusiasts who were on the edge of their seats waiting for the next release likely jailbroke one or all of their iOS devices the very day the tool was released. Those a day late to the party were greeted with Totoateam’s browser-based repack of Pangu’s jailbreak that worked right through mobile Safari, without the need for devices to be connected to a computer. If you yourself were eyeing this convenient alternative, we have some bad news for you – the Totoateam’s offering no longer works, well, at least for now. The JailbreakMe-esque jailbreak installs an app and corresponding certificate onto your device, where the latter requires verification for the app to be installed, launched and the jailbreak to proceed. 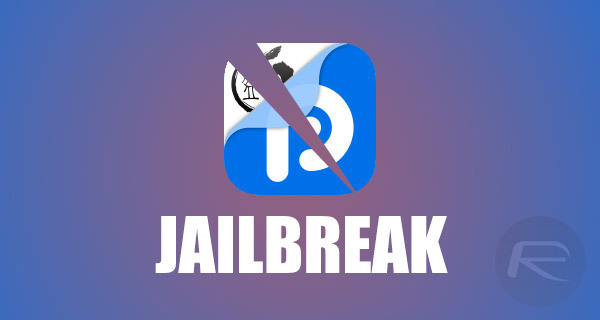 Apple has, understandably, revoked the signing certificate from its end, which will prevent users from installing the aforementioned “PPJailbreak” app. 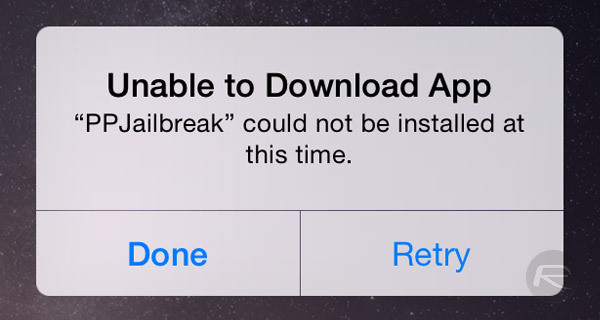 If you try to jailbreak now using the Safari method, you are going to get “Unable to Download App – PPJailbreak could not be installed at this time.” error, as shown in the screenshot below. The method could be resurrected with a PPJailbreak .IPA signed by another Apple Developer account, but Apple is likely to crack down on the signing identity soon after it pops up. If you’d rather not wait and see how this game of cat and mouse plays out, you could always opt for the original method. It is slightly less convenient in that it requires you to download a Windows tool and connect your device to a computer, but it’ll get the job done. You can view our full tutorial here: How To Jailbreak iOS 9.3.3 On iPhone 6s, 6, 6s Plus, 6 Plus, 5s, iPad, More [Tutorial]. As Pangu has only released a Windows variant of the jailbreak tool, Mac users will have to make use of a little workaround, described in the following post: Jailbreak iOS 9.3.3 On Mac OS X With Pangu For Windows [How-To Tutorial]. Also, those of you who jailbroke using Safari method will need to install a new version of PP jailbreak app on their device. This is the app which is used to re-jailbreak after every reboot, but since Apple has revoked access when installed via Safari, you’ll need to get it back using Windows jailbreak tool. You can find the instructions for this here: Fix Re-Jailbreak With Pangu / PP App Not Working After Reboot, Here’s How. So Are they doing a fix so We can install again? Or just use Xcode to resign the ipa with you own cert. I got the pp app downloaded on same day and it jailbreak works, should I be concerned too? Will the existing cert be removed?? Question is are we able to load the pp app and re jailbreak once we’ve rebooted the iPhone, this is using the safari jailbreak method? Extract it from your phone. As long as you can open the app there should’nt be a problem. My app still working fine. Just don’t remove the certerficate. Just google for PPJailbreak.plist. Within that plist is the download link to the ipa. Wow! I never knew that whoring yourself to AIDS victims could pay so good. Jailbreak is non-payment tools. Why you blaming apple? Or you are not exploring about “what is jailbreak”? Developer already told to all of us jailbreaker over the world, “nothing is paid as long as they still can copy and paste, that we called HACK”. Shame on you, you are wasting your money.